Strawberry rhubarb pie was first made in England around the turn of the 19th century. Photo © Kraft. 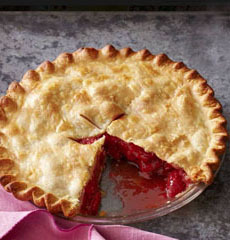 National Strawberry Rhubarb Pie Day is June 10, but anytime you see fresh rhubarb is the time to make this delicious pie. 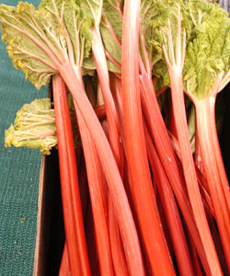 Spring is rhubarb season; in North America it grows between April and June. Technically, rhubarb is a vegetable, a member of the sorrel family (see the difference between fruits and vegetables). Even for a vegetable, it is very tart. Before it was sweetened, it was added to soups (try it in lentil soup!) and sauces—in the Himalayas, in Moroccan tagines and Middle Eastern stews. Be sure to cook only the stems; the leaves are mildly toxic (they contain oxalic acid). But for most of us, rhubarb needs a sweetener. It’s absolutely delicious as stewed rhubarb, rhubarb ice cream, rhubarb pie and its variation in this recipe, strawberry rhubarb pie. Some people eat the stems raw by dipping them into sugar. Rhubarb grew wild in northwest China, and was cultivated about 5,000 years ago for medicinal purposes. It made its way west via Turkey and Russia, and was first planted in England by an apothecary in 1777. Properly sweetened, it became popular for jams, sauces and crumbles. This recipe makes a 9" pie. You can use the double pie crust in the recipe or make a lattice top. Or, you can make a meringue lattice: Bake the pie open-face, then pipe on a meringue lattice top. Return the pie to the oven for five minutes or until the meringue browns. Rhubarb is a beautiful vegetable—but don’t eat the leaves—they’re mildly toxic). Photo courtesy OurOhio.org. Thanks to Heather Frost! Make the crust (if using a prepared crust, skip to step 5). Cut the flour in with the fat, using a pastry blender, a blending fork, the “two knives” method or fingers. Work quickly so that the shortening does not soften. The mixture should be the size of peas. Using a tablespoon, sprinkle ice water onto the mixture, stirring it with a fork until the consistency enables you to pat the dough lightly into a ball. Do not knead the dough and do not over-handle it. Touch the dough as little as possible to ensure a tender crust. Divide dough into halves. One half can be slightly larger (for the bottom crust). Wrap the dough in wax paper, plastic wrap or foil and chill for 2 hours or longer—the colder the dough, the less it will stick. Leaving the top crust dough in the refrigerator, roll out the bottom crust on a pastry board (see options below), pastry cloth, pastry mat or counter top dusted very lightly with flour (too much flour toughens the pastry). Press the ball lightly with a rolling pin to flatten. Roll out from the center. Use quick, light strokes to roll to a 1/8" to 1/4" thickness, an inch larger than the pie pan. Fold in half and gently lift into the pan; do not stretch the dough as you unfold and move it into place. Trim the edge with a scissors, allowing 1/2" for crimping. Mix together the sugar, flour and egg. Blend with the chopped rhubarb. Spoon filling into the crust. Prepare the top crust in the same manner as the bottom crust. Cut a design or a round hole with a small cookie cutter; then brush the edge of the bottom crust with water. Fold the top crust per Step 4 and place it atop the filled bottom crust. Trim the edges with a scissors; then crimp the crust with your fingers (or use the tines of a fork). If using a prepared crust, be sure to cut a steam vent. Bake 40 minutes, until the crust is browned.